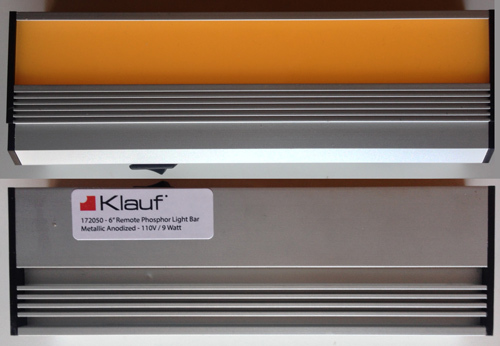 Yesterday we had a first look at the Klauf Light Bar as finally delivered following its successful Kickstarter fundraising effort. Here's what it looked like coming out of the box. The ones I chose as my reward for backing the Kickstarter are anodized aluminum. Black is also available. 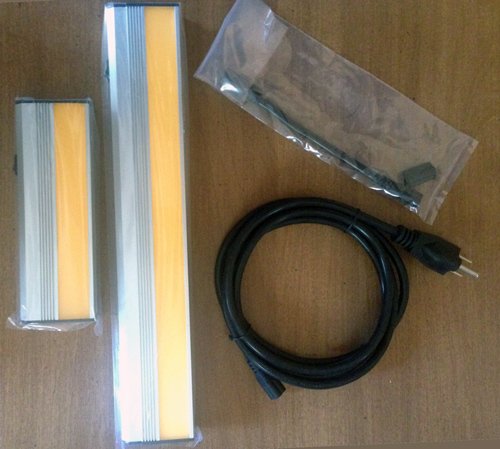 Once the Kickstarter backers' wares have all been shipped, Klauf will begin selling the Light Bars from its own site and on Amazon (no sign of Klauf there yet). Note that the photos that follow were taken over a period of time in various conditions of ambient light. No flash was used, so the colors in a couple of them vary a bit. The package came by USPS. 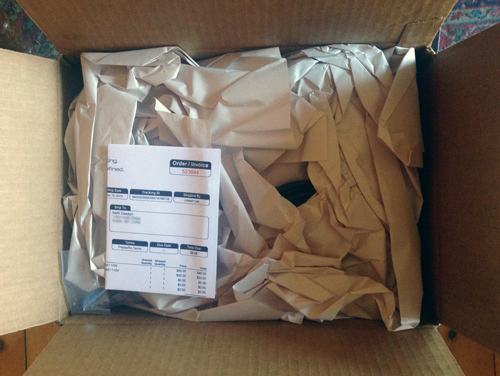 The packaging material is all eco-friendly paper. If you look very closely, you can see that my Light Bars were packed by Joseph Lee, Klauf’s president. 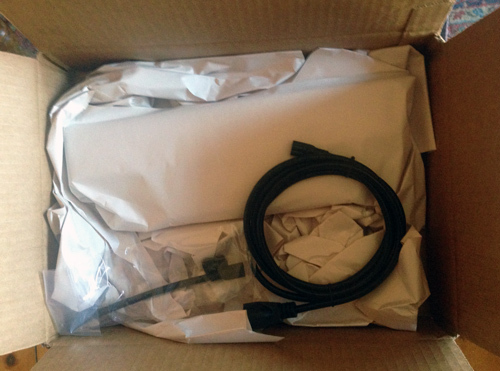 Power cable, Power Bridge connectors, a cover for the electrical receptor, and the two paper-wrapped Light Bars, one 12 inches and the other six inches. Here are the Light Bars, business side up. The stubby Power Bridge connector (upper right) is for use if deploying the Light Bars butted together, directly adjacent. The longer connector gives six inches of separation. 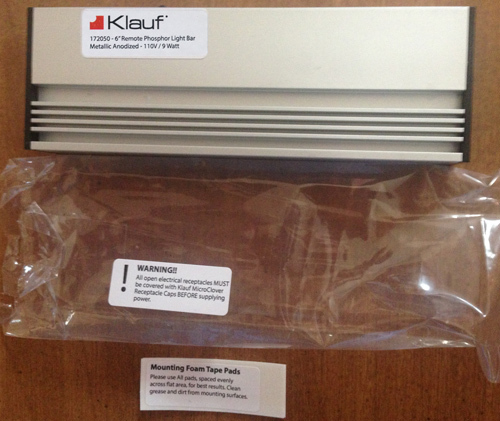 Other lengths of Power Bridge up to 48 inches will be available from the Klauf site and presumably from Amazon. I hope one of the supplied lengths is two inches; that would be just about perfect for turning a close 90° corner in a run of Light Bars. Here’s the back side of the shorter Light Bar. The label on the packaging warns that all electrical connections must be covered by MicroCover Receptacle Caps before power is applied. At the bottom is the supply of double-sided adhesive pads. Three are supplied for the six-inch bar, and five are supplied for the 12-inch bar. They go on the flat part of the bar (as shown at top) and adhere to any flat surface. 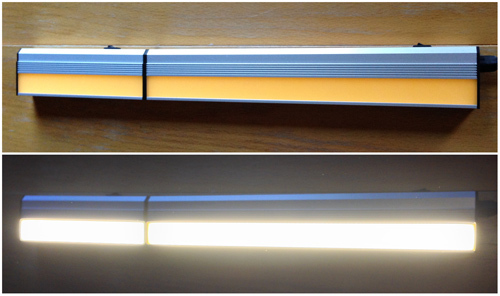 Closeup of the six-inch Klauf Light Bar, front and back. The appearance of the phosphor is closer to a light egg-yolk color than the near-orange in this photo. Klauf uses an Intematix remote phosphor. The two Light Bars connected with the supplied Power Bridge, in the off and on state. Each segment has its own power (rocker) switch.